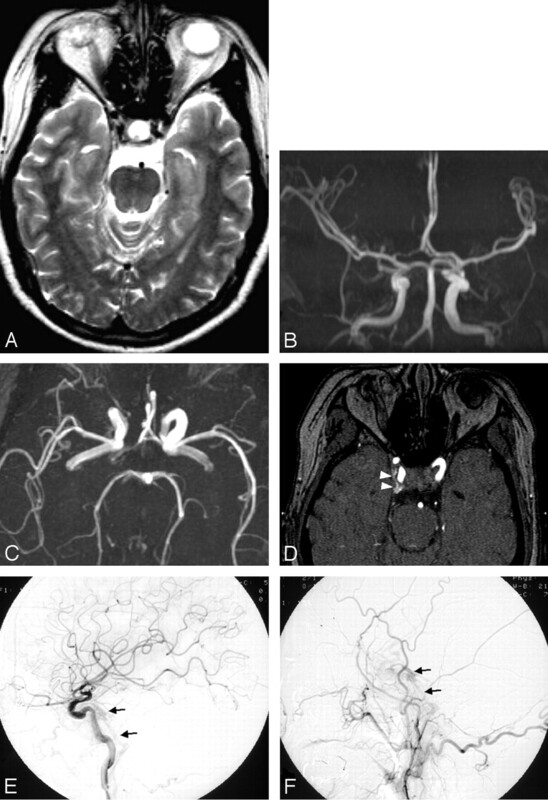 Various MR imaging findings of several intracranial dural arteriovenous fistulas. A and B, T2-weighted axial image (A) shows a flow void cluster near the right transverse sinus (open arrows). The flow void cluster corresponds to a dural arteriovenous fistula itself (black arrows) on an oblique occipital arteriogram projection (B). C and D, T2-weighted axial image (C) shows a subacute hematoma in the right temporal lobe (white arrows), engorged ophthalmic veins (black arrowheads), and proptosis on the left side (white arrowheads). Lateral projection of right external carotid angiogram (D) obtained a month after MR imaging reveals a cavernous dural arteriovenous fistula (black arrows) with only an anterior drainage pathway (double arrowheads) and no leptomeningeal venous drainage associated with hemorrhage. 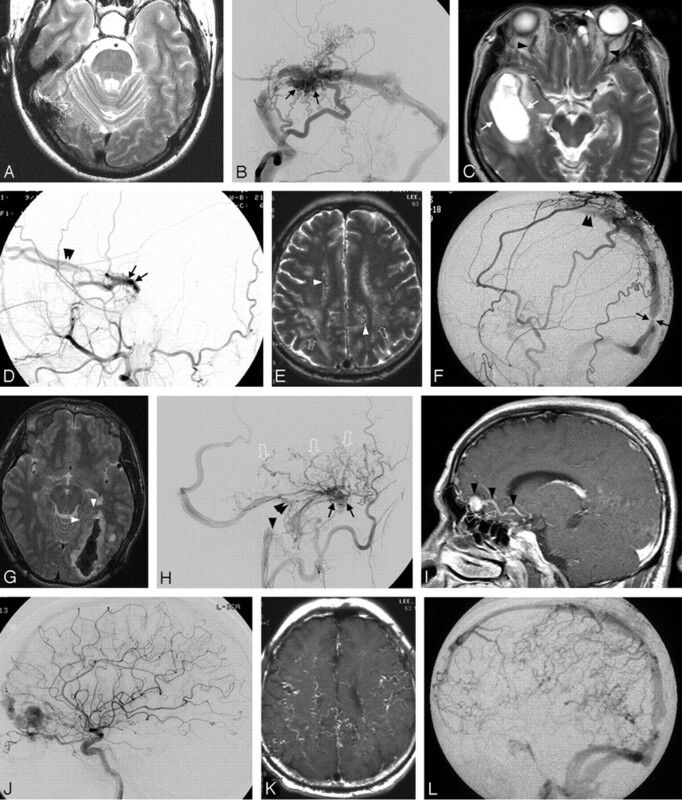 A posthemorrhagic spontaneous leptomeningeal venous regression may have occurred to show no leptomeningeal venous drainage despite the hemorrhagic event. E and F, White matter hyperintensity (open arrows) is seen with dilated leptomeningeal or medullary vessels (white arrowheads) on T2-weighted image (E). Lateral projection of an external carotid angiogram reveals a superior sagittal sinus fistula (open arrowheads) fed by the superficial temporal, middle meningeal, and occipital arteries. The retrograde venous flow (double arrowheads) may be related to the stenotic segment just above the torcula herophilli (black arrow). G and H, Acute occipital hematoma with adjacent dilated vessels (white arrowheads) is seen on T2-weighted image (G). Multiple dural arteriovenous fistulas are identified on occipital angiogram (H), which are present at the jugular bulb (black arrowhead), superior petrosal sinus (double arrowheads), and sigmoid sinus (black arrows). The fistula related to the occipital hematoma seems to be a sigmoid fistula because it develops multiple leptomeningeal venous reflux (open arrows). I and J, Postcontrast T1-weighted sagittal image (I) shows an enhancing leptomeningeal vein with a varix (black arrowheads). Just below the varix a flow void cluster is also seen (open arrowheads). Internal carotid angiogram (J) reveals an anterior skull base fistula fed by the ethmoid artery and draining to the cortical veins and superior sagittal sinus. K and L, These images belong to the same patient as panels E and F. Postcontrast T1-weighted axial image (K) shows prominent tortuous enhancing vessels. External carotid angiogram in the delayed phase (L) reveals severe cortical venous refluxes. MR angiographic findings of dural arteriovenous fistula in a 41-year-old woman with progressive visual disturbance. Flow-related enhancement of a fistula (white arrowheads) and the sigmoid sinus (white arrows) are seen on frontal and lateral 3-D TOF MRA maximum-intensity-projection views (A and B). Source image of MR angiography (C) well visualizes the fistula (white arrowhead) and sinus (white arrows) with flow-related enhancement. Lateral projection occipital angiogram (D) reveals a sigmoid sinus fistula with transosseous dural feeders (arrowheads), leptomeningeal venous drainage (black arrow), and sinus stenosis (double arrowheads). 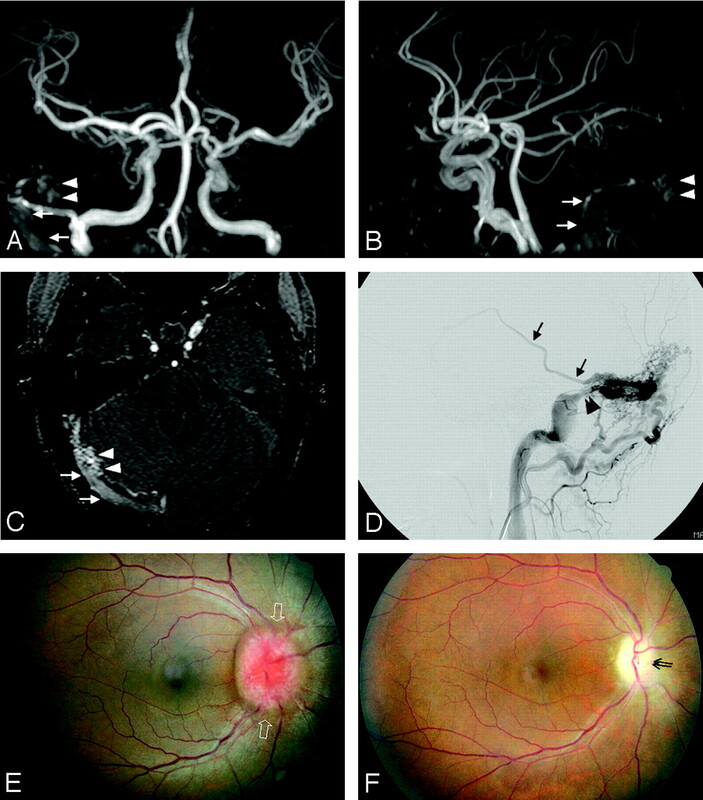 A fundoscopic examination obtained 3 months before (E) and after (F) the first session of endovascular treatment reveals papilledema (open arrows) and optic disk atrophy (double arrows). This patient eventually lost ipsilateral visual acuity and kept the contralateral visual acuity unchanged. A false-negative case on MRA maximum-intensity-projections; 57-year-old woman with diplopia and ptosis. T2-weighted axial (A), and frontal (B) and superior (C) 3D TOF MRA maximum-intensity-projections show no evidence of dural arteriovenous fistula. Only MRA source image (D) reveals the fistula with flow-related enhancement of the right cavernous sinus (white arrowheads). The cavernous and inferior petrosal sinuses (black arrows) are demonstrated with slowly shunted, faint contrast filling on lateral projections of internal and external carotid angiographies (E and F). Note.—RLVD indicates retrograde leptomeningeal venous drainage. Numbers in parentheses indicate percentages.